Signs Into Law Bill to Cut Off Aid to Palestinian Authority. 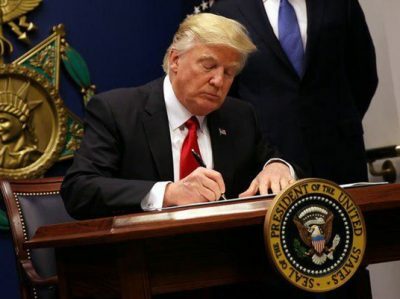 US President Donald Trump has signed into law legislation that halts some aid to the Palestinian Authority until it stops paying Palestinian prisoners in Israeli jails and the families of those killed by Israeli forces. Trump cut the Palestinian aid as he approved the massive $1.3 trillion omnibus spending bill on Friday. The law includes three exceptions, allowing for US aid to Palestinian water and childhood vaccination programs, as well as to East Jerusalem al-Quds hospitals. Sami Abu Zuhri, the spokesman for Palestinian resistance movement Hamas, also condemned the law. Relations between the US and Palestine have been strained since December 2017 when Trump recognized Jerusalem al-Quds as Israel’s capital and vowed to relocate the US embassy in Israel from Tel Aviv to the occupied city. In January, the US administration decided to cut its financial contribution to the United Nations’ Relief and Welfare Agency (UNRWA) that renders aid to Palestinian refugees. The US State Department announced that Washington would hold back 65 million dollars to UNRWA – more than half its planned contribution this year – and demanded that the agency make unspecified reforms. UNRWA was established by the UN General Assembly in 1946, one year after the creation of the Israeli regime. More than half of the two million people in the Gaza Strip depend on support from UNRWA or other humanitarian organizations.